A pair of giltwood side tables, a Bible printed by John Basket and a painting of an ostrich from the Marble Hall were some of the historical artefacts salvaged from the Clandon Park fire. The National Trust said on Friday afternoon that a significant amount of the stately home’s collection had been rescued from the fire. Crews from Surrey Fire and Rescue Service continued to damp down the scene on Friday, following the blaze which ripped through the 18th century stately home on Wednesday (April 29). The house has been left a burnt out shell and a cordon remains in place around the site. Staff are now assessing what they have been able to salvage and also determining what has been lost. Board listing the rules to be observed in the servants’ hall at Clandon, eighteenth century. The hangings of the Clandon state bed, made in about 1710. 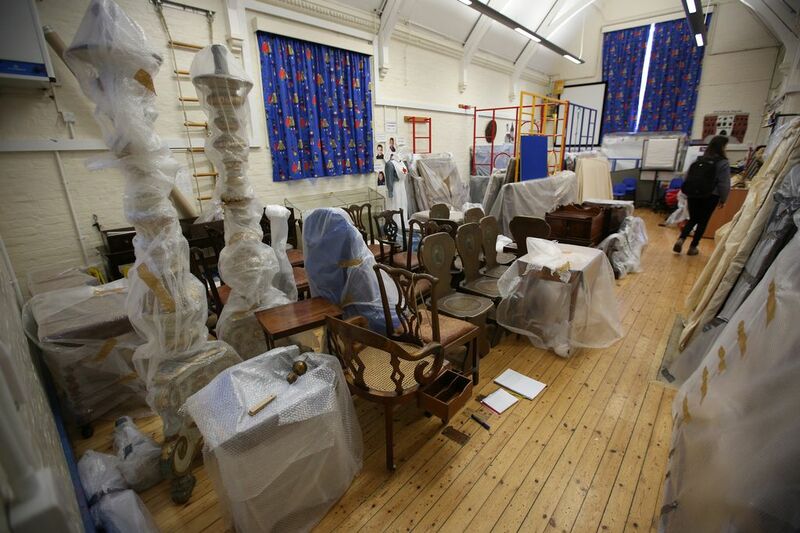 The hangings had just returned to Clandon following conservation treatment and were still packed up. The trust added that until a full assessment was done, it would not be possible to confirm the objects that did not survive. National Trust director general, Dame Helen Ghosh, said: “Although the house was pretty well burned out, the operation rescued a significant amount of the collection, and we are hopeful there will be more to recover when our specialists are able to get inside the building and start the painstaking archaeological salvage work. “But there is a lot that we will never recover. “The immediate sense of shock and loss amongst staff working at the property has quickly been replaced by a steely determination. ” The team at Clandon, staff from other properties and local volunteers have responded with tremendous fortitude, calmness and professionalism to the event. “When the overall impact of the fire is clearer, we will be able to decide on the longer term future of the house. “I’d like to again thank the magnificent job of the Surrey fire brigade. Their teamwork and professionalism has been awe-inspiring. A spokesman for Surrey Fire and Rescue Service said on Friday: “The investigation into the cause of the fire is ongoing, but due to the complexity of the incident this will take some time to complete. Those items that were saved had been temporarily stored in a nearby location. Three vans arrived there on Friday afternoon and workers could be seen loading paintings, tables, vases and chairs into the vehicles. The National Trust said that at this stage it did not know what the future held for Clandon House, but it is welcoming any donations, which can be made by calling 0344 800 1895.